I use the NotifierBuilder to create a notifier, and then create a Notification using the NotificationBuilder. 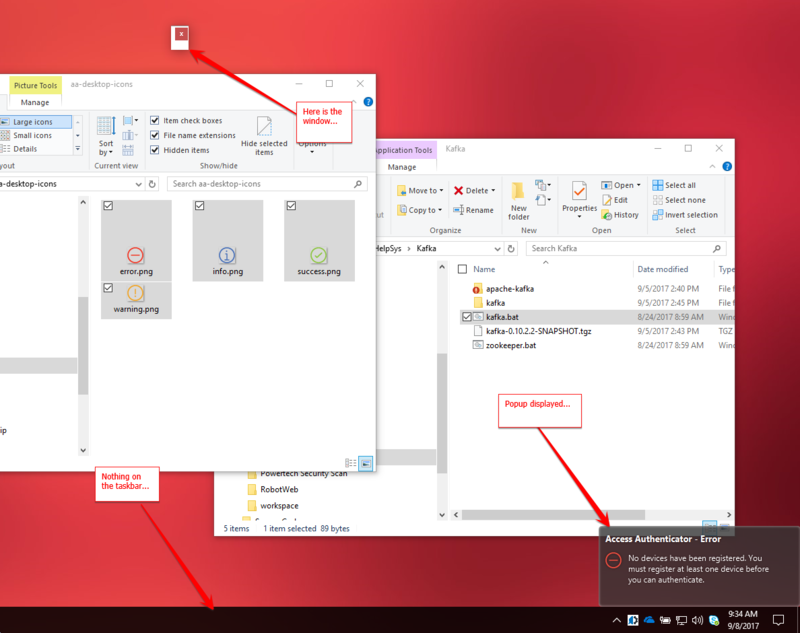 When I invoke the notifier.notify(notification) method, it creates a ghost window on the Windows taskbar that doesn't disappear when the Popup disappears. Here is a screenshot of the window that appears. Can you try with last commit? I just modified some minor things but not sure if it has an effect on Windows. Thanks for your timely response! I have a tight timeline for my project, and this notification tool is exactly what I need. So, thank you for that as well! Could it be a Windows 10 thing? I kind of doubt it. It's most likely a Windows or a Java thing. If we could specify more than one StageStyle like TRANSPARENT and UTILITY, this would not be a problem. I'm happy to assist in any way I can. I'll keep seeking answers in the meantime unless you find an answer before that. I tried the code from above, but to no avail. The window does not appear on the taskbar, but it appears on the desktop as a tiny window with only a close ('X') button. Here is another screenshot of the window in action.